Set-up – Participants are asked to dropoff their poster on Monday before 12:00. 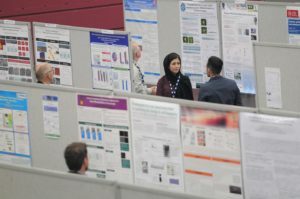 Attendance – Presenters should be at their posters during poster session time to interact with conference delegates. Consider providing small (8.5×11 inch) versions of your poster as handouts to participants to enhance networking. Don’t want to travel with your poster in hand? You can contact McGill Printing below to have quote for onsite printing.